The combination of a delay in an incinerator study and the lessening of air pollution rules can only mean one thing – more pollution! An anti-incinerator campaigner has warned Runcorn residents that the results of a study into the health impacts of burning waste near homes may never published. Former Environment Agency worker Michael Ryan’s fears came following an article in public affairs magazine Private Eye, which said the preliminary results from a two-year research project are not due to be released until later this year. 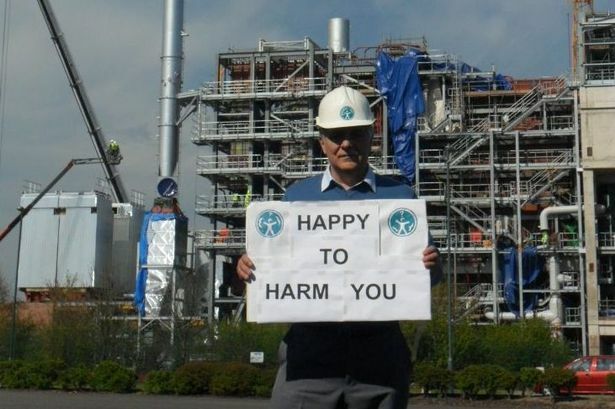 Michael Ryan outside the Harlescott incinerator in Shropshire. The now-dissolved Health Protection Agency had commissioned the study to be carried out by Imperial College and its findings were supposed to be published last March. Mr Ryan said that incinerator projects including in Runcorn have ploughed ahead without those in authority having any evidence to back their claims about risks to residents in neighbouring areas. Governments, including the UK, are allowing energy industry representatives to help draw up Europe’s air quality limits resulting in proposed standards on coal plant emissions that are weaker than China’s, claim the campaign group. New limits on air pollution in Europe have been watered down because governments are allowing some of the worst polluters to help draw up the rules, according to a Greenpeace investigation. The Guardian has also learned that despite UK claims to the contrary, energy industry representatives repeatedly and forcefully pushed for weaker pollution limits at meetings in Brussels. As a result of ongoing lobbying, the proposed European Union standards on toxic emissions from coal plants will be less strict than in China, the green campaign group said.